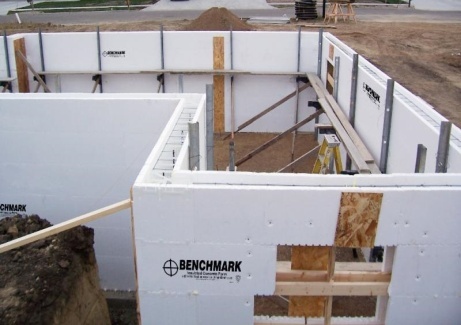 With all the options for Insulated Concrete Forms (ICF) on the market today, you might ask, “Why Benchmark?” Here’s why; as a Midwestern manufacturer, we believe that building strong relationships with our customers is why we continue to meet all their ICF needs. We manufacture an ICF block that is ideal for any building specification, above or below grade and can adapt to special wall shapes, if needed. The folding capabilities of our ICF allow easier and cost effective shipping. A residential project typically fits in 3-4 pallets, solving your needs without congesting your work area. During concrete pours, Benchmark ICFs stay solid and once set, offer homeowners lifelong energy savins. On top of our commitment to superior quality, we back every order with an On-Time Delivery Guarantee. Your product will arrive by the agreed-to date or we will discount your invoice 10 percent. We know you have a tight schedule and we work to accommodate your needs, even if it needs to be rushed. Don’t get left waiting in the rain. Benchmark guarantees on-time delivery for eery order. Next time you need ICFs, give us a chance to show you first-hand what the Benchmark difference is. Call us today at 800-658-3444.